Many of the refinements found in our 824K Loader are the product of the brightest minds in the industry — our customers. Loader owners and users such as you talked, we listened, and the K-Series is the result. Loaded with productivity- and uptime-boosting features such as a quieter, more spacious cab. Enhanced Quad-Cool™ system. More powerful hydraulics. Easier-to-view monitor with expanded functions. And a longer list of options. 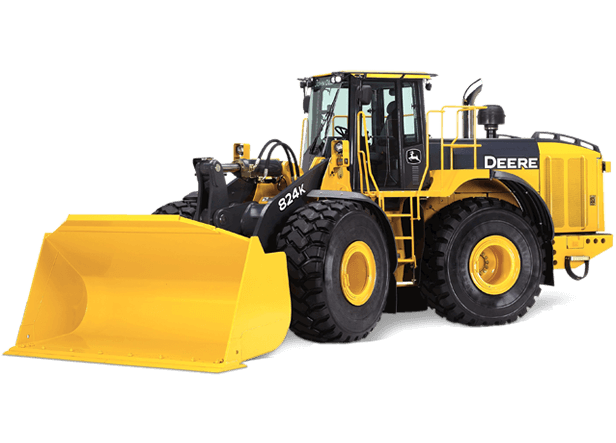 Standard equipped with plenty of production-enhancing features, the 824K Loader can handle almost anything. But if your isn't just any application, we've got you covered with a wide variety of factory- or dealer-installed factory-options. Work in a high-debris, extreme-temperature, or corrosive environment? Or emission-sensitive nonattainment areas? Need a high-lift boom or long-life cutting edges to help maximize productivity and minimize costs? We can equip your loader with exactly what you need for your kind of work.